FREEMAN, Douglas Southall. Lee's Lieutenants: A Study in Command. New York: Charles Scribner's Sons, 1942-1944. 1st eds. 3 Vols. lvi,773;xlv,760;xlvi,862pp. Portraits, maps, folding map. Orig. cloth, non-priceclipped d/js. Jackets a bit rubbed, else a very good set. HOWES F-349. Wright F-519. Presentation inscription on the front free endpaper of Vol. One: "To Lt. Col Joseph I. Greene with the admiration of Douglas Southall Freeman" Additionally Freeman has written "This is one of 100 advance copies of the first printing of the first edition-D.S.F." Laid in is a typed letter signed from Freeman to Greene on the letterhead of The Richmond News Leader. Freeman writes: "I thank you for your kindness to accept a copy of "Lee's Lieutenants." I send you the first volume today and shall send you the next when it appears in the early spring and the third, when published, in the winter of 1943-44. I might have known that you would see the parallel between our current problems of command and those of 1861-62. I shudder a hundred times when I ask myself could we have a Beauregard somewhere to fizzle out after a First Manassas." "Greene was a military historian and editor of The Infantry Journal. The other two volumes have the card of "Mr. Robert Thomas Jones" affixed to the front free endpapers. Jones was known at NASA as "one of the premier aeronautical engineers of the twentieth century." "Stands on its own right as one of the great works of military history"-In Tall Cotton, 61. "The ablest descriptive and evaluative study of the leading generals (and their campaigns) in Lee's army; massively documented, movingly written, highly authoritative, and fairly smug"-Nevins I,p.30. New York: Charles Scribner's Sons, 1942. First Editions. Hardcover. Very Good Plus to Near Fine in Very Good Dustjackets. FIRST EDITIONS, published successively in 1942, 1943, 1944, all with the Scribner letter "A" present on the copyright pages. Top/Bottom edges trimmed, foredges untrimmed. Hardly noticeable rubbing to extremities and one corner on Vol. II slightly nudged, only. Soft deckle fore-edges. Gilt lettering to spines and fronts of black cloth-covered boards. 2,395 pp. with appendices, principle manuscript sources, acknowledgments, bibliographies, and indices. SIGNED by Douglas Southall Freeman on the half-title of Volume I. Dustjackets: Edgewear. Small chips missing from bottom of spines. All volumes show original price of $5.00 to front upper flap, and are mylar protected. Each jacket front features a black and white illustration with title lettering in red, blue and green, respectively. Photographs and short narratives of eight of Lee's predecessors and lieutenants begin each volume. 101 maps. A large, 17 x 17", fold-out map titled Battlegrounds of the Army of Northern Virginia follows index of volume 3. Covering the generals of the Army of Northern Virginia during the American Civil War who fought under Robert E. Lee. Volume One, Manassas to Malvern Hill, could be regarded as the book of Beauregard, Johnston, Magruder, D.H. Hill, Garnett, Jeb Stuart, Ewell, Gustavus Smith, and Stonewall Jackson; Volume Two, Cedar Mountain to Chancellorsville continues by giving us a look at John Hood, Robert Rodes, John Cooke, Ramseur, Pender and Wilcox; Volume Three, Gettysburg to Appomattox concludes with the "deepening twilight of the South's declining military might, to the tragic inward collapse of the Command and the formal surrender in 1865," (back cover volume 3). "In its completed form this tremendous study is a towering landmark in the literature of American biography and in all the literature of war," (front flap). New York: C. Scribner's Sons, 1943. First edition. . Hard cover. Fine in fine dust jacket. Near Fine in Near Fine Dust Jackets. A couple of jackets have tiny closed tears. Additional shipping required. Please inquire prior to purchase. 3 volume set. 3 v., 24 leaves of plates: ports., maps (part fold. ); 24 cm. Includes: Illustrations, Maps, Portraits. Bibliography: v. 3, p. -825. v. 1. Manassas to Malvern hill. --v. 2. Cedar mountain to Chancellorsville. --v. 3. Gettysburg to Appomattox. Volume 1 published 1943-Not a First Edition Volume 2 published 1943-First Edition Volume 3 published 1944-Not a First Edition This set does not ship outside the United States. NY: Scribner's. Very Good in Poor dust jacket. 1942. Hardcover. Volume I, Manassas To Malvern Hill. 1st edition, 1st printing, paper is torn along front hinge exposing inner mesh but front cover still firmly attached. Signed Douglas Southall Freeman in Freeman's distinctive signature on front free endpaper. All corners of covers slightly bumped. Dust jacket is chipped, most loss is along top of spine and at fold between front flap and upper right of front panel, not price-clipped. Volume II, Cedar Mountain to Chancellorsville is a 1945 (later) printing, original pub. date of 1943. Dust jacket is also not price-clipped, only slightly chipped at top of spine. Volume III, Gettysburg to Appomattox. A 1st edition, 1st printing, former owners signature on front free end paper. Chipped non price-clipped dust jacket, some loss at top & bottom of spine and folds at flaps, missing up to 3/4" across top of spine (mostly missing less than that), and up to 1/2" at bottom of spine (again, mostly less than that). All dust jackets are now in new clear mylar protectors. All volumes are in good (Vol. I) to very good (Vol. II and Vol. III) condition, with gold title stamping on front and spine. Slight browning to Vol. I inside back cover, looks like a shadow from an old clipping. A very nice dust jacketed set with a rare Freeman signature. ; Signed by Author(s) . New York, NY: Charles Scribner's Sons, 1942. 1st Ed 1942-1944. Prices unclipped. Volume 1: Manassas to Malvern Hill, 771p, Volume 2: Cedar Mountain to Chancellorsville, 760p. Volume 3: Gettysburg to Appomattox, 862p with folding map. Each volume has several illustrations and maps. Classic Civil War study of the Confederate leadership. DJs have light wear/chipping. Later printing. Volumes are clean and tight.. 1st Edition. Cloth. Very Good+/Very Good. 8vo - over 7¾" - 9¾" tall. FREEMAN, Douglas Southall. Lee's Lieutenants: A Study in Command. New York: Charles Scribner's Sons, 1942-1944. 1st eds. 3 Vols. lvi,773;xlv,760;xlvi,862pp. Portraits, maps, folding map. Orig. cloth, non-priceclipped d/js. Jackets a bit rubbed, else a very good set. HOWES F-349. Wright F-519. Vol. One signed by the author on front free endpaper. "Stands on its own right as one of the great works of military history"-In Tall Cotton, 61. "The ablest descriptive and evaluative study of the leading generals (and their campaigns) in Lee's army; massively documented, movingly written, highly authoritative, and fairly smug"-Nevins I,p.30. "LEE'S LIEUTENANTS" - A Study in Command by Douglas Southall Freeman. Complete in 3 volumes. First Edition set with dust jackets - the volumes are dated 1942, 1943 and 1944 (volumes I and II have the Scribner's "A" 1st printing designation on the copyright page); Charles Scribner's Sons; New York. Each volume contains portrait photographs as well as maps. VOLUME I: Manassas to Malvern HillVOLUME II: Cedar Mountain to ChancellorsvilleVOLUME III: Gettysburg to Appomattox Condition: The volumes are in very good condition both inside and out. The covers and spines of all 3 volumes are clean with no stains and bright gilt lettering; sharp corners. All are tightly bound with no cracks and no loose pages. All 3 volumes are very clean on the inside - no stains, tears or foxing found. 2 volumes have a name/school/date (1943) written in pen...no other writing found. The dust jacket for volume III is in very good condition; tears at the spine heads and flap corners of the jacket for volume I; the jacket for volume II is in poor condition the back panel and flap are detached from the spine and the majority of the spine has torn and is not present. The jackets are not clipped and have the original prices on the front flaps. (Each dust jacket comes with a clear protective sleeve.) Light tanning to end papers. 2007-07-08. New. Ships with Tracking Number! INTERNATIONAL WORLDWIDE Shipping available. Buy with confidence, excellent customer service! 1997-04-07. New. Ships with Tracking Number! INTERNATIONAL WORLDWIDE Shipping available. Buy with confidence, excellent customer service! Charles Scribner's Sons, 1944. First Edition. Hardcover. Good. 3 Volume set. C. Scribner's Sons, 1942-44. Clean, unmarked pages. Rebound in 3/4 gray leather with gray boards. Gilt ruled. Otis L. Guernsey's Armorial book plate (Vincit Omnia Veritas) on verso. Marbled end pages. Outer spine edges worn at crease, front cover of Vol 1 detached. Minor rubbing, scuffs to spine. 24 cm. v. 1. Manassas to Malvern hill --v. 2. Cedar mountain to Chancellorsville --v. 3. Gettysburg to Appomattox. This is an oversized or heavy book, that requires additional postage for international delivery outside the US. Scribners, 1942. Book. Very Good-. Hardcover. Signed by Author(s). Hardcover in jacket. Pages are starting to pull away from binding at top of spine to first 20 pages, running down about two inches (an easy repair). Couple small chips to spine ends of jacket and couple half-inch tears across front and rear flap folds. $5.00 price on jacket with Scribners "A". Signed by Freeman in his typical small script on front endpaper..
2005-08-06. New. Ships with Tracking Number! INTERNATIONAL WORLDWIDE Shipping available. Buy with confidence, excellent customer service! New York: Charles Scribner's Sons, 1942. Vol. 1: 1942, 774 pp. ; Vol. 2: 1943, 760 pp. ; Vol. 3: 1944, 862 pp. Original black cloth covers w/ titles in gilt. Bindings lightly soiled and rubbed; spines sunned w/ light fraying to ends. Corners of Vols. 1 & 2 a bit bumped w/ small crease to top corners of first several leaves of Vol. 2. Light, natural toning to endpapers of all volumes. Previous owner's name on front paste-down of Vol. 1. Illust. w/ portrait photos and military maps w/ a fold-out map in rear of Vol. 3.. First Editions, First Printings. Hard Cover. Very Good/No Dust Jacket. 8vo - over 7¾" - 9¾" tall. 1972-09-03. New. Ships with Tracking Number! INTERNATIONAL WORLDWIDE Shipping available. Buy with confidence, excellent customer service! New York: Charles Scribner's Sons, 1942 Book. Fair. Hardcover. Signed by Author(s). 1st Edition. Fair+ to Good - 3 volume set of First editions, signed on ffep of Vol 1 by author; publication dates 1942, 1943, 1944; extremities rubbed; books in po plastic covers; stain to front edge of vol 1which extends about 1/4" into about 100pp; epp tanned; text clean & tight otherwise.. The Easton Press, 1991-01-01. Leather Bound. Like New. Gorgeous 3 volume leather bound, gilt-edged set. Charles Scribner's Sons, 1942. Hardcover. Collectible: Good/Missing. Author signed 1942, 43, 44 Scribner's three volume set missing jackets and slipcase. All three volumes are first printings, Freeman signed volume one on the flyleaf. All three volumes exhibit moisture crinkling. oversized and overweight Please email for photos. Charles Scribner's Sons. Collectible - Very Good. SIGNED! NY: Charles Scribner's Sons 1942. Volume 1 only. 1st with 'A'. Hardcover 8vo 773 pgs. B/w plates and maps. Signed by Freeman on front endpaper. Very good in a good dust jacket. Black cloth with gilt. Slight edgewear to covers. Foxing spots to top edge and fore edge. Contents clean and binding sound. Jacket edgeworn and lightly soiled. Inquire if you need further information. New York: Charles Scribner's Sons, 1946-1949. Three volume set, published between 1946-1949; octavo; VG/Fair; light blue, yellow and pink spines with black text; slip case is worn but strong, chipped around edges; jackets are worn, stained, chipped and torn around edges, price clipped on front flap, completely intact; boards are strong, wear around edges, minor white stains; textblocks are significantly age discolored, text is clean, handwriting and plates from previous owner in front, volume 1 has significant wear on fore edge. [Oversized book. Additional postage necessary for expedited/international orders. Economy International shipping unavailable due to weight restrictions. For international/expedited customers, please inquire for rates]. Full-priced Rockville. New York, NY: Charles Scribner's Sons, 1943. Volume 1: Manassas to Malvern Hill, 771p, Volume 2: Cedar Mountain to Chancellorsville, 760p. Volume 3: Gettysburg to Appomattox, 862p with folding map. Volume 3 has Scribner's "A" on copyright page. Each volume has several illustrations and maps. Classic Civil War study of the Confederate leadership. All 3 vols are clean and tight although covers are lightly faded... 1st Printing. Cloth. Very Good+/No Jacket. 8vo - over 7¾" - 9¾" tall. New York, NY: Charles Scribner's Sons, 1943. 3 Vol set. (1943-4) Volume 1: Manassas to Malvern Hill, 771p, Volume 2: Cedar Mountain to Chancellorsville, 760p. Volume 3: Gettysburg to Appomattox, 862p with folding map. Each volume has several illustrations and maps. Classic Civil War study of the Confederate leadership. Volumes 1 and3 are somewhat worn and faded . All 3 vols have gift inscription but are otherwise clean and tight.. Cloth. Very Good+/No Jacket. 8vo - over 7¾" - 9¾" tall. New York: Charles Scribner's Sons Dates: 1942-1946 Original black cloth covers w/ titles in gilt. Bindings lightly soiled. Light foxing to endpapers. Inscription to previous owner on front blank endpaper of Volume 1. DJ's are lightly soiled and rubbed w/ edge wear and tear. Spines a bit sunned. Vol. 1 price clipped. Vol. 3 has approx. 8" wide x 2 1/2" long piece missing from front panel and front flap. Illust. w/ portrait photos and military maps.. Hard Cover. Very Good-/Fair or Better. 8vo - over 7¾" - 9¾" tall. New York: Charles Scribner's Sons, 1944. Original black cloth covers w/ titles in gilt. Bindings lightly soiled. Spine ends slightly bumped. DJ's are lightly soiled and rubbed w/ edge wear. Light chipping to corners and spine ends. Spine of Vol. 2 a bit sunned. All volumes price clipped. Illust. w/ portrait photos and military maps.. Early Printing. Hard Cover. Very Good/Good to Very Good. 8vo - over 7¾" - 9¾" tall. New York: Charles Scribner's Sons, 1942. Hardcover. Three volume set. Numerous photographs, illustrations, and maps, including one folding. New York: Charles Scribner's Sons, 1942-44. Later printings. Sweeping narrative history of the Army of Northern Virginia under Robert E. Lee, rendered through multiple biographies of his key generals, including such diverse personalities as Lieutenant Generals Thomas "Stonewall" Jackson, James Longstreet, Ambrose Hill, Richard Ewell, Jeb Stuart, Jubal Early, John Bell Hood, George E. Pickett, etc. 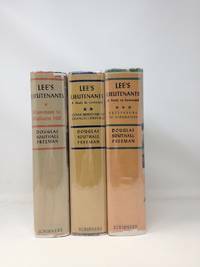 Arguably Freeman's most popular work, Lee's Lieutenants was written between his monumental, multi-volume Pulitzer Prize-winning biographies of Robert E. Lee (1935) and George Washington (1957). Original black cloth bindings, with gilt stamping. The dust jackets of the first two volumes are price-clipped and rather shelfworn. The third volume lacks a dust jacket. Some general minor fading and wear along the extremities of the publisher's slipcase; otherwise very good. Norwalk, CT: Easton Press, 1991. Hardcover. Fine. New York, NY: Charles Scribner's Sons, 1972. 3 Vol set. Volume 1: Manassas to Malvern Hill, 771p, Volume 2: Cedar Mountain to Chancellorsville, 760p. Volume 3: Gettysburg to Appomattox, 862p with folding map. Each volume has several illustrations and maps. Classic Civil War study of the Confederate leadership. Volumes 1 and3 are somewhat worn and faded . All 3 vols have gift inscription but are otherwise clean and tight.. Cloth. Near Fine/Near Fine. 8vo - over 7¾" - 9¾" tall. 1991, 1991. BOUND IN LEATHER WITH GILT LETTERING AND DESIGN ON COVERS PLUS GILT EDGES AND SILK ENDPAPERS AND SILK BOOKMARK. Limited Leatherbound Edition. Hardback Leatherbound Books . Fine Condition. SCRIBNERS. Collectible - Very Good. NY: Charles Scribner's Sons. 3 volume set dated 1944, 1943 and 1945. Early printings but not 1sts. Scribner seal to all copyrt pgs but no 'A'. Hardcovers 8vo 773, 760 and 862 pgs. B/w plates and illustrations, very good fold out map at rear of vol 3. Very good in good dust jackets. Light edgewear to covers. Light foxing to endpapers. Contents clean and bindings sound. Jackets are edgeworn, chipped and spines are lightly soiled and/or foxed. 5.00 orig price to flaps of all 3. Inquire if you need further information. Norwalk: Easton Press, 1991. Hardcover. Fine. Bound in the publisher's original grey composition leather, stamped and decorated in gilt. All edges gilt. New York: Charles Scribner's Sons Dates: 1944-1946 Original black cloth covers w/ titles in gilt. Bindings very bright and clean. Faint discoloration to rear cover of Vol. 2. Light foxing to edges of text block. Natural toning to endpapers. Front hinge starting, and a small piece torn from title page, of Vol. 3. DJ's moderately soiled and rubbed w/ edge wear. Mild chipping to corners and spine ends. Approx. 3" wide x 1/2" long piece missing from top of DJ spine of Vol. 3. Illust. w/ portrait photos and military maps. Contents nice.. Hard Cover. Very Good/Good+. 8vo - over 7¾" - 9¾" tall. Charles Scribner's Sons, 1/1/1942. Hardcover. Good. Signed. Inscribed and dated 1961, by Inez Z. Freeman, Douglas's wife. 3 Volume set. 1942, 1943, 1944. All volumes are first printings with Scribner "A". Hardcovers. No dust jackets. Wear to extremities. Sunning to spines. Photo taped down to fep of Vol. II. Front hinge of Vol. II and rear hinge Vol. III cracked. Clean, unmarked pages. Ships daily. This is an oversized or heavy book that requires additional postage for international delivery outside of Canada and the US. NY: Scribners 1944. 3 volumes, 1/1/1944. Hardcover. Very Good. 8vo. 3 volumes. Hardcover. No dust jackets. Good binding and cover. Minor shelf wear. Slight sunning to covers, especially on Volume 3. Personal library bookplate inside first 2 volumes. Owner's inscription on ffep of Volume 3. Otherwise, clean, unmarked pages. Includes all photographic plates and maps. A well-preserved set in very good condition. This is an oversized or heavy book that requires additional postage for international delivery outside of Canada and the US. Ships daily. NY: Charles Scribner's Sons, 1970. black c w/gilt titles; djs w/lite wear, unclipped prices, in mylar. Hardcover. Very Good/Very Good. Illus. by B&w Illus. 8vo - over 7¾" - 9¾" tall. 1986-05-09. New. Ships with Tracking Number! INTERNATIONAL WORLDWIDE Shipping available. Buy with confidence, excellent customer service! Scribner, 1940-01-01. Regular. Hardcover. Used:Good. New York: Charles Scribner's Sons Book. Very Good. Hardcover. 8vo - over 7¾ - 9¾" tall. Light shelf rubbing, minor chipping to the jacket spine tops of vols. one and two; previous owner's bookplate to each of the first free endpapers. Texts are clean. 'This tremendous, sweeping narrative is a new departure in that it presents what is in effect a multiple biography against a flame-shot backdrop of history. It is the story of the great figures of the Army of Northern Virginia who fought under Robert E. Lee as they came forward on the stage of War.' Volume 1, Manassas to Malvern Hill, 773 pages. Volume 2, Cedar Mountain to Chancellorsville, 760 pages. Volume 3, Gettysburg to Appomattox, 862 pages..
New York: Charles Scribner's Sons Dates: 1943-1945 Original black cloth covers w/ titles in gilt. Bindings lightly soiled and rubbed; spines a bit sunned. Light natural toning to endpapers. Inscription to previous owner on front blank endpaper of Vols. 1 and 2. Previous bookstore's label on rear paste-down of Vols. 1 and 2. Illust. w/ portrait photos and military maps. Contents nice.. Early Printings . Hard Cover. Very Good/No Dust Jacket. 8vo - over 7¾" - 9¾" tall. New York: Charles Scribner's Sons Dates: 1970-1971 Original black cloth covers w/ titles in gilt. Bindings very bright and clean. Light foxing to edges of text block. DJ's moderately soiled and rubbed w/ mild edge wear. DJ spine of Vol. 3 a bit sunned. Illust. w/ portrait photos and military maps. Contents very nice.. Hard Cover. Very Good+/Very Good-. 8vo - over 7¾" - 9¾" tall. Scribner. Hardcover. 0684837854 Please allow 4 - 14 business days for Standard shipping, within the US. Thank you for supporting our small, family-owned business! . New. 1997-04-01. Scribner. Hardcover. 0684837854 Please allow 4 - 14 business days for Standard shipping, within the US. Thank you for supporting our small, family-owned business! . Fine. 1997-04-01. Charles Scribner's Sons, New York, 1972-06-01. Hardcover. Used:Good. New York: Charles Scribner's Sons. Very Good with no dust jacket. 1943-44. Hardcover. 3 volume set. Volume I is not a first, has an owner name, 773 pps, has minor edge wear, and has light fading especially to spine. Volume II is a first edition, 760 pps, has very minor edge wear with light pulling at head of spine, and is not faded. Volume III is not a first, has a bookplate, 862 pps, and is similar to Volume I in condition and level of fading. ; Large 8vo 9" - 10" tall .